Fresh, high quality, naturally-dried, natural and has not been treated or coated in any way. Rhubarb is a strange-looking plant with a very interesting history, and belongs to the Polygonaceae family of plants. It is widely considered as a vegetable, but in America, it is considered a fruit, since it is mainly used as a fruit in culinary practices. Rhubarb is packed with minerals, vitamins, organic compounds, and other nutrients that make it ideal for keeping our bodies healthy Vacuum-packed for Freshness! 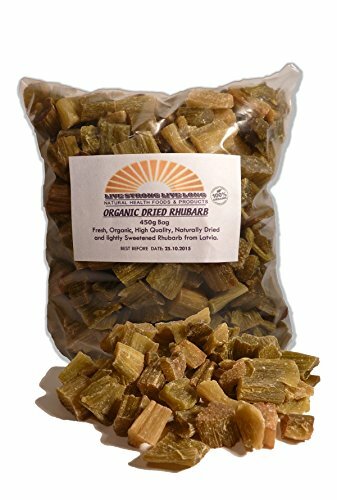 Delicious, soft, chewy, nutrient-rich, high quality, tasty Dried Rhubarb Pieces. Rhubarb is extremely low in fat and cholesterol, and the most prominent vitamin in rhubarb is actually vitamin K, and Vitamin K plays a very significant role in brain and neuronal health. 100% Organic, Non-GMO, Raw, Kosher, Gluten-free, Vegan. Eat Rhubarb as a healthy snack or use in recipes like oatmeal, cookies, cereal, salads, smoothies or even with your tea. Aids in Weight Loss and stimulates bone repair and growth, and production of red blood cells. If you have any questions about this product by Live Strong Live Long, contact us by completing and submitting the form below. If you are looking for a specif part number, please include it with your message.